The nose on this dram is oddly nice: pickled lemons masquerading as a pickled peach in an attempt to score a date with a sweet pickle (there’s more action than you’d think on picklemingle.com). Unfortunately, he’s not that into her, but he won’t tell her that (he’s not a dill, after all). Another note on the nose hits like floor polish, but one so thick and rich that you’re tempted to put on ice cream when you’re in a mood. Will it act like Shell®? Fingers crossed… While I’m waiting to see if it sets up, I also get notes of a burning cinnamon bush. I listen attentively, but it’s not speaking to me. The mouth is better than the nose: champagne grapes and undercurrants. Of what, you ask? If you have to ask that, you’ve already missed the joke. The mouth grows in potency moment by moment, but it’s fine: champagne and cold cream mousse. Mistletoe and holly berries, but not Hallie Berry (unfortunately). There’s a note on the tail end of a shallot and tomatillo omelette left uneaten. The finish offers a savoriness that makes me want to eat a spinach and Grana Padano quiche out of an oiled teak bowl. There’s a mustiness and hints of an orange/almond liqueur lingering from the nose, across the mouth, and into the finish. It also gives a burst of spice or fire (it’s hard to distinguish which it is) on the finish that is medium long and fairly intense at first, not unlike biting into a Vidalia onion as if it were an apple (but not quite like when you’d thought it actually was an apple). The finish finishes with a caramel malty note that is nicely redemptive. 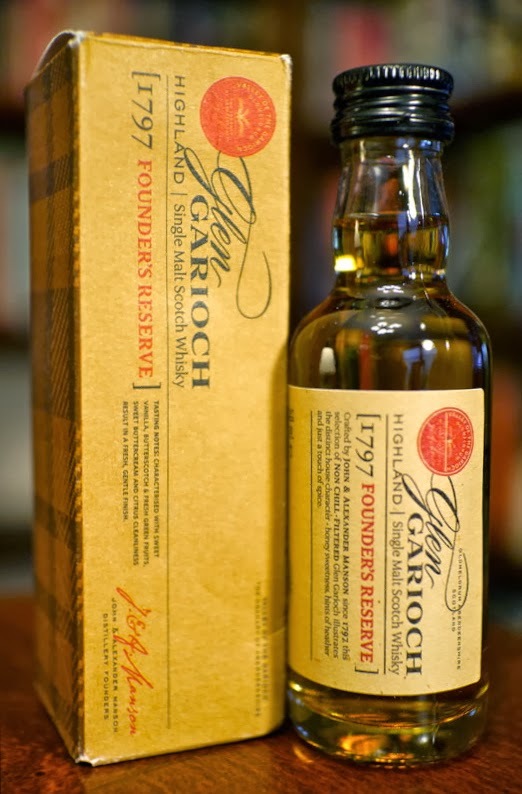 The Glen Garioch Founder’s Reserve is Jimmy Carter–After a fairly miserable Presidency, he’s learned to stop talking about how many times he’d committed adultery in his heart. Oh, and he’s helped build countless houses for the disadvantaged via Habitat for Humanity and won the Nobel Peace Prize.